Proper maintenance of your sump pump system ensures a waterproofing system that's ready for peak performance when water is building around the foundation. As is the case with all mechanical things, a sump pump has moving parts that will eventually break down. Having a service specialist check an interior perimeter drainage system and sump pump can be done in one easy, inexpensive annual visit. 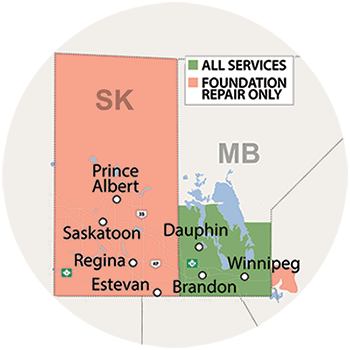 Call or contact us today to have your system serviced-- we operate throughout Manitoba, including Winnipeg, Arnot, Brandon, Brochet, Dauphin, Island Lake, Little Grand Rapids, Lynn Lake, Melita, Nunalla, Port Nelson, Russell, & Swan River. To maintain a sump pump system, the sump pump and switches should be checked to ensure they're running smoothly and will not clog. All debris, mud, and sediment that has made its way into the sump pump liner is cleaned out, and your battery backup sump pump is tested for proper charge and voltage. The sump pump alarm's battery is checked, and a flood test is conducted on the whole system to make sure it's running properly. Outside of your home, the discharge line is checked for clogs and potential freezing issues. Any other options installed with your system, such as basement windows, window wells, or downspout extensions, are also inspected and cleaned. Additionally, your serviceman will check for signs of other existing or potential problems and, if necessary, offer solutions so the installation offers proper protection. 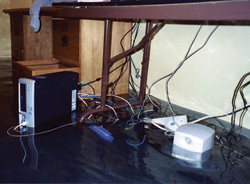 A sump pump installation needs to be counted on all the time to keep the basement dry. Having a serviceman keeping it running smoothly is a small price to pay to keep your investment working for you as it should! A lifetime warranty will never be offered by a reliable sump pump manufacturer. Mechanical parts eventually break down, and a long-term warranty that promised that it would not break down will never make the pump work any better. A sump pump will need maintenance and repairs. If a warranty offers "free replacements", then you need to ask yourself: "When would I ask for my free replacement?" Unfortunately, the answer to that question is "After your pump has failed and your basement has flooded". A flooded basement is far from "free"! With a quality basement waterproofing contractor, the best equipment, and annual maintenance, you can be sure your basement is kept dry! BlueMaxx Basement Systems has been servicing Manitoba since 2003, and we have the reputation, established business, and reputable products that you need for a dry, usable basement space. They are also certified dealers of the Basement Systems basement and crawl space network- the largest of its type in the world. Their sump pump systems include the award-winning SuperSump® and patented TripleSafe Sump Pump. For a free sump pump estimate and professional inspection in your home, call or contact BlueMaxx Basement Systems online today! Each estimate comes with a FREE, full-color 88-page book, and all estimates come with no obligation to the homeowner.